^ Cosgrove, J.A. Aspects of the Natural History of Octopus dofleini, the Giant Pacific Octopus. M.Sc. Thesis. Department of Biology, University of Victoria (Canada). 1987: 101 pp. ^ O'Shea, S. The giant octopus Haliphron atlanticus (Mollusca : Octopoda) in New Zealand waters. New Zealand Journal of Zoology. 2004, 31 (1): 7–13. 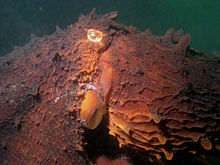 ^ O'Shea, S. Haliphron atlanticus — a giant gelatinous octopus. Biodiversity Update. 2002, 5: 1. ^ 4.0 4.1 Norman, M. Cephalopods: A World Guide. Hackenheim: ConchBooks. 2000: 214. ^ Smithsonian National Zoological Park: Giant Pacific Octopus 互聯網檔案館的存檔，存檔日期2014-02-23. ^ High, W.L. The giant Pacific octopus. U.S. National Marine Fisheries Service, Marine Fisheries Review. 1976, 38 (9): 17–22. ^ 。Walla Walla University Marine Invertebrates Key: Giant Pacific Octopus 互聯網檔案館的存檔，存檔日期2009-01-14.